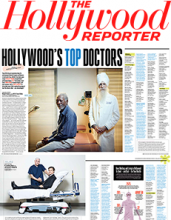 Dr. Teitelbaum is named in this year’s Top Doctors list from the Hollywood Reporter. For its second annual Top Doctors Issue, The Hollywood Reporter elicited stories of drama, trauma and triumph over both by surveying 2,000 professionals in the film, television, movie, music, sports and media fields to find out who are the most beloved, trusted and go-to physicians in L.A.
Doctors do not and cannot pay to be included, rather, the Hollywood Reporter’s editors partner with Castle Connolly, the U.S.’ preeminent medical-database authority, to identify 469 of the highest-rated practitioners in their specialties. Doctors are nominated by their peers in an extensive survey process of thousands of U.S. doctors each year. The listed doctors rank in the nation’s top 10 percent and are among the very best in their specialties and communities. Castle Connolly screens these doctors’ medical educations, training, hospital appointments, disciplinary histories and much more.